Do You Have What It Takes to Be a Champ? John pictured here to the left. Photo taken at the Olympic festival in 1986 where he placed second to the world record holder. I can’t remember exactly when I met John, as a matter of fact, I don't know if we ever formally introduced ourselves to one another. One day we got to talking and I just new John as "The Champ." 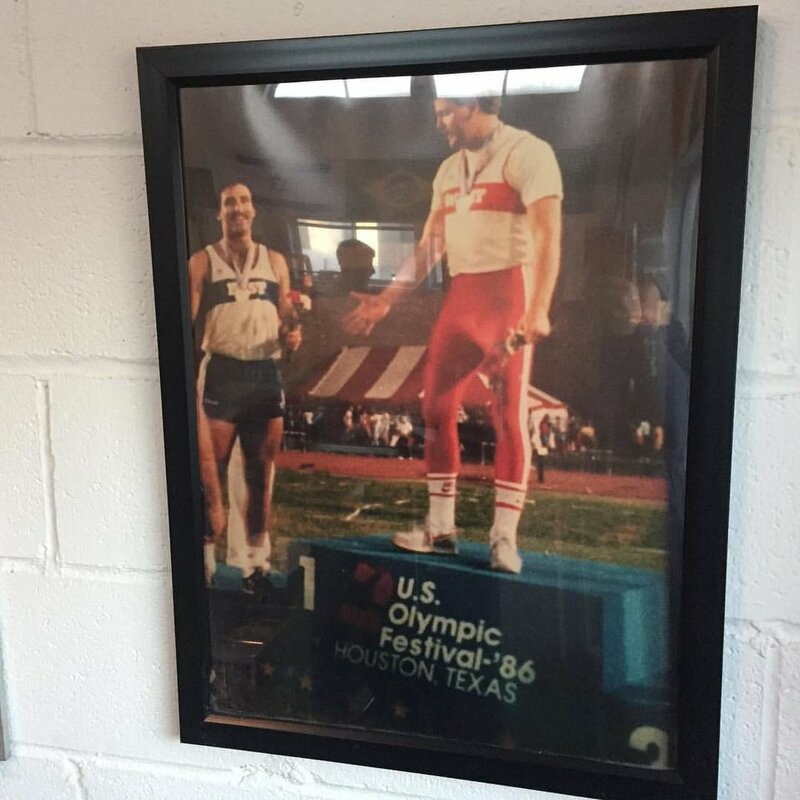 Few years ago John and I went to the same CrossFit Box. Most mornings I would catch a glimpse of John jogging around the gym as part of his warmup routine. You always knew it was him because of his glasses, high socks and he was always super focused on whatever he was working on. Every day it was the same. John would walk in, take a light jog around the gym, and off to his work. At the time, no one really knew about John's background in track and field, breaking records in javelin throwing, medaling at nationals, oh and along the way how qualified to try out for the Jr. Olympics. Upon meeting John you will quickly notice that he is soft spoken, humble about his accomplishments and really never satisfied on his performance. He is always looking into the future and likes to reflect on his goals as Masters athlete. US Masters Nationals and John (pictured on the left) placed 4th. John was always a natural athlete, having played football and baseball in high school. But it was track and field that stole his heart, that and his wife who he met in college. Freshman year of high school he played football and after the season was over, his coach selected a few players from the football team to start a winter track team. His coach was clever on how recruited kids for the team. It was sort of presented like a thing to do in the winter because football was over. "Hey, let's give winter track and field a try since there isn't much else to do in the winter anyway." But when Spring came around and it was baseball season, who was going to tell their coach that they were going to do baseball instead track in the spring?” None of them…. Ha! John did do baseball and track one spring semester, but it soon faded. Eventually John would get into disc, move on to county championships and and broke school records. Javelin throwing wasn’t something he really practiced. Initially he actually wasn’t very good at it since his focus was disc. But junior year of high school he filled in at a competition that involved a relay and they were in need of a javelin thrower. That year he picked up javelin throwing and soon found out it came natural to him. As he progressed through high school and college, John had managed in a short time to try out for the Junior Olympics in 1981 and that same year came in third at nationals. In college he won U.S. Jr. Nationals, qualified for U.S. JR team and competed against the Canadians and won. Most weekends you will find John at Ketcham High School near where he lives, still practicing Javelin. As with anyone entering adulthood, you do what is called "adulting". These things may consist of getting married, finding a steady job in your career and having children. For John he did take some time off, but continued working out in his basement and basically just lifting from home. He did get out of shape at one point it was great effort to get back into things. In 2007 Masters World Championships was in held in California. He competed but had a couple nagging injuries. The guy who won that year he knew from his 20s when throwing. John noticed he was in great shape and asked about his training routines and that's how John was introduced to CrossFit. "Certainly there are limitations.. but you can do things." He eventually learned how to do bar muscle ups, legless rope climbs etc. All of it brought back great memories to his younger days and loved that he was still learning. However, the lifting part of CrossFit interested him greatly. 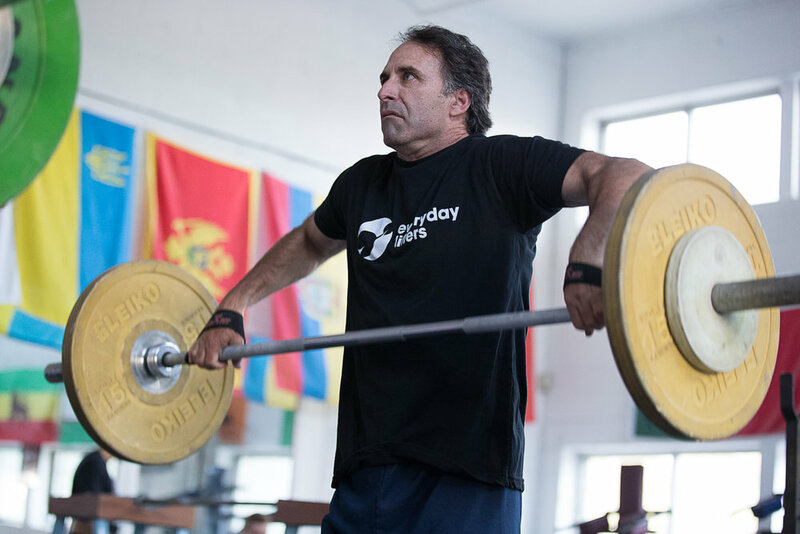 Like for many weightlifters who get into the sport later in life, John started focusing more on the of sport of olympic weightlifting and that's when he found his coach, Dan Casey. He met his coach at a seminar and that's when John got to thinking about his future goals. He started setting time aside to practice his lifts. "Keep the goal the goal. Keep that focus." In his head he wanted to get better at the olympic lifts. Everything else he was doing was holding him back a bit from his goals. He felt javelin throwing and weightlifting complimented each other. John is really an amazing human being. I imagine John is what coaches wish for in all athletes. (John is reading this right now is saying he is not deserving of this). lol. It's just who he is. #humble. Before I wrap this up... Here are some thoughts on A Methodical Approach to Training, written by John. Please guys, if you know him, talk to John and ask him questions. We all have a lot to learn from him. Behind every successful man is a busy lady. Picture here the beautiful Mrs. Tullo. Thank you John for your time on this feature. Looking forward to seeing crush some weights in 2018! Guys, don't forget to share, like and comment! Thank you! This is a personal blog of Everyday Lifters. Any views or opinions represented in this blog are personal and belong solely to the blog owner and do not represent those of people, institutions or organizations that the owner may or may not be associated with in professional or personal capacity, unless explicitly stated. Also, I am not a blogger, this sort of happened. You will find errors in my writing. Just keep reading and enjoy the photos. The owner will not be liable for any errors or omissions in this information nor for the availability of this information. The owner will not be liable for any losses, injuries, or damages from the display or use of this information. It’s taken me about 2 years to get through the list of those who volunteered. And today, we have the final Everyday Lifter feature, Tom. Tom came to my home studio on August 28th, 2018. Seems like forever ago. We chatted, took some photos and shared our experiences with anxiety. A lion has awoken within Jessica Lucero. I saw this same look with Max as well. It’s hard to describe it. After hours of watching weightlifters, I notice the most subtle changes in their step and body posture. Photos may not be used or reproduced without permission.